Join us on the 21st of March for the 63rd National Landlord Investment Show. The show will once again be held in Olympia with over 100 stands in Olympia, 40 seminars to attend and what's more the tickets are free, you just need to register your interest here. Plus you can also catch us in Seminar room 5 at 1.30pm seminar, read on to see what we will be discussing. This is a popular event amongst landlords with leading companies exhibiting and sharing their knowledge so it is one not to be missed! You'll have the opportunity to discuss property hotspots and the future of the buy-to-let industry, plus listen to an array of discussions with seminars happening throughout the day. We will be exhibiting on the day, so come and find us at Stand 108 to talk all things Airbnb Management. Not only will you be able to meet the Portico Host team on the day and have them answer any burning questions you may have regarding Airbnb Management and Short lets, on the 21st we will also offering one lucky landlord two months free management with Portico Host. At 1.30pm in Seminar room 5 we will be discussing two strategies to get better yields. Talking about how you can let for 90 days on airbnb and run short or long term lettings to optimise return on investments in London with Portico Host. We will then look at opportunities in the North West where Airbnb is flourishing and how with Portico Host, investors can earn 10% + yields. We’ll discuss opportunities for investment now, and how you can make great returns. Portico Finance will be with us on the day and available to discuss your options and lend advice. With over 50 lenders available we are well positioned in the market and can offer a specialised buy-to-let service. Tickets are free you just need to register, so what are you waiting for! Register now. 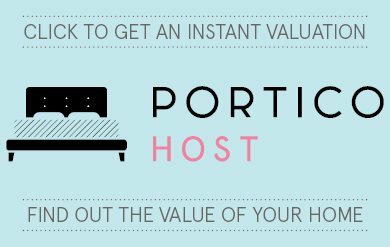 Have you got a property you'd like managed through Portico Host? Give our team a call on 0207 099 4000 to find out more or try our Instant Valuation Tool.!!!! !